Boogie Down with a brand new Fortnite bundle for Nintendo Switch. A wealth of bundles have been announced for the Nintendo Switch just in time for the upcoming holiday season. Among them is the Fortnite Double Helix Bundle, which is currently set to launch on October 5. While the Fortnite bundle lacks the bells and whistles of other bundles, such as the Super Smash Bros. Ultimate Edition bundle, it does feature a fair price point of $299. At $299, the Fortnite bundle costs as much a regular Nintendo Switch console, which makes sense given that Fortnite itself is free-to-play. To make the bundle more appealing, several highly coveted in-game items have been included. Namely 1,000 V-Bucks (regularly $9.99) and the full Double Helix cosmetic set which features a custom Glider, Character Outfit, Back Bling, and Pickaxe. The only real downside to the bundle is the fact that it lacks a custom design, as the bundle comes with a standard Red and Blue Joy-Con version Nintendo Switch. Nevertheless, the price makes up for the lack of a physical game and custom Switch. 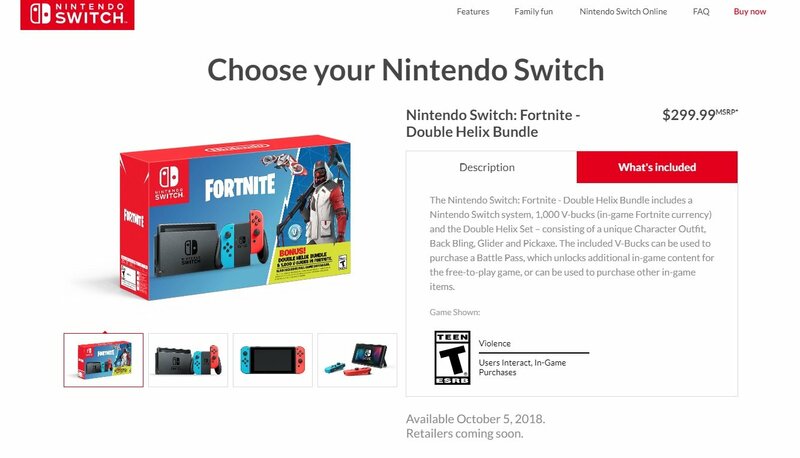 So, if you have kids who are obsessed with Fortnite and have been begging for their own Nintendo Switch, this is definitely a bundle to keep in mind. The Fortnite Double Helix Bundle will be available starting October 5. Right now, pre-orders for the Fortnite Double Helix Bundle are unavailable, with the Nintendo landing page featuring a “retailers coming soon” message. When pre-orders and orders go live, the bundle will likely be available at locations including GameStop, Amazon, Target, Walmart, and the Nintendo store. Be sure to check back, as we’ll be updating this as new information becomes available. In the meantime, what do you think of the new Fortnite Double Helix Bundle? Does the price make it a worthwhile gift, or would you prefer to grab a different Switch bundle and add Fortnite V-Buck credits to the recipient’s account separately? Let us know down in the comments below!